Marble is commonly used to make kitchen and bathroom counters, flooring, statues and decor. A highly porous stone, marble stains easily and requires regular maintenance to keep the material looking its best. Wipe away any spills from marble surfaces immediately, and remove stains as soon as possible for the best results. A variety of commercial marble cleaners are currently available, but common household items can also keep your marble in top shape if you use them properly. Marble counters require special care to maintain. Dust marble surfaces once or twice a week. Dip a clean, cotton cloth in lukewarm water. Wring out any excess water and wipe the marble with the cloth. Wipe again with a dry cloth to remove moisture and prevent streaks. Wash marble once or twice a year with soapy water. Combine about five drops of liquid soap to each cup of water. Dip a cotton cloth in the solution, wring out excess and wipe the marble. Dip another cloth in clean water, and wipe the marble to rinse. Wipe again with a dry cloth to remove moisture. Wash marble counters in kitchens and bathrooms once a week using a mixture of 1 part liquid fabric softener and 2 parts warm water. Combine the two ingredients, dip a clean cloth in the solution and wipe the counters well. Rinse with warm water and polish with a soft, dry cloth. Cut a bar of soap into five or six pieces, and place them into 2 cups of hot water. Stir until the soap dissolves and creates a thick, syrup-like consistency. Dip a clean paintbrush into the mixture and paint onto heavy stains. Allow it to remain on the marble for about five days, and wash off with warm water. 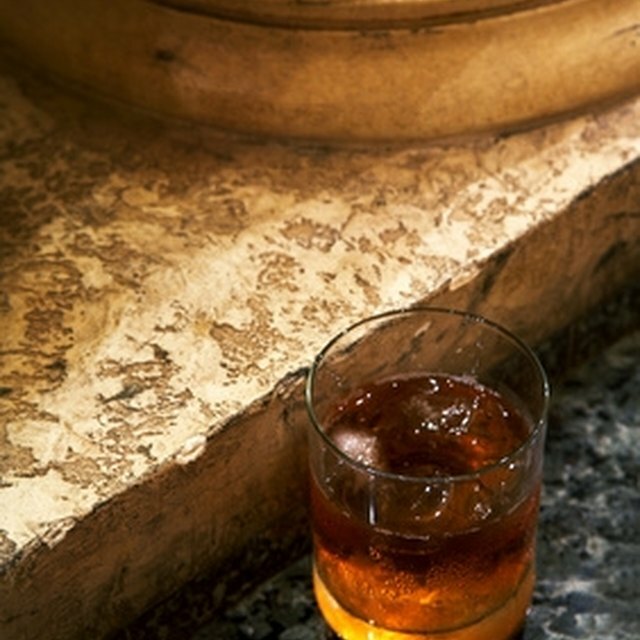 The Michigan State University Extension recommends using coasters under beverage glasses when placed on marble surfaces to avoid moisture rings. Add a protective finish to your marble surfaces by applying a light coating of paste wax according to the manufacturer's instructions and buffing well. Do not use acidic products, like lemon juice or vinegar, on marble. They will etch the surface and cause damage to the stone. Avoid scourers and solvent-based cleaners for the same reason.